Today’s test review is yet another one from the ‘homescreen replacement’ category. Yes, there are already several of these apps out there, and more and more keep popping up. I can’t even count the number of times I was really impressed by an app of this type, thought I’d found the crème de la crème, only to discover an even better one shortly thereafter. Find out whether this is the case for today’s featured app in this test review. ADW.Launcher offers as many as seven screens, an App Drawer, as well as the Galaxy S version, which allows you to flip through your apps horizontally. To the left and right of the App Drawer icon in the lower half of the screen you’ll find two Action Buttons; you can decide what these buttons should do or else switch them off, if you feel you don’t need them. If you scroll up via the App Drawer icon you’ll reach a further bar into which you can insert up to six icons (using Drop & Drag). Again, if you don’t need this bar you can also deactivate it. By pressing on the Home button you can quickly access the individual screens. To do so you have to make a few additional settings (see below for more details). You can change the settings of almost every ADW.Launcher feature: for instance, determine the speed of scrolling, change the App Drawer animation or the background transparency. Find out more under Screen & Controls. There are a few reasons why ADW.Launcher has upped the anty and I’ve decided to dump its predecessors. I really like the Galaxy S app bar, as well as the hidden shortcut bar in the lowe half of the screen. After having installed it, you can start ADW.Launcher by pressing the Home button. You can also choose to use it as your standard homescreen app. You’ll find the App Drawer icon at the bottom of the screen. On either side there are two free buttons (if you want to use them as shortcuts towards other apps just pull the app in question on to the button). There are also two Dots which let you know which screen you’re currently on. You can switch screens by sliding your finger across the screen, but also by clicking on the Dots. Sliding upwards on the App Drawer icon opens the additional bar in which you can locate six icons. They’re accessible from every screen. You can access Galaxy S via the App Drawer; from here you can scroll through your apps horizontally. The Dots in the upper part of the screen let you know on how many pages your apps are located, and which page you’re currently on. I liked the fact that after you’ve closed and re-opened the App Drawer you find yourself on the last page you’d been on prior to closing. You can also use the Standard Drawer (more details below). There’s a Donate Button situation at the bottom which links you to the Paypal page. The Display settings allow you to fade out the status bar at the top of the screen, as well as determine the number of screens, the scrolling speed, and the intensity of the ‘ringing’ of the screens. 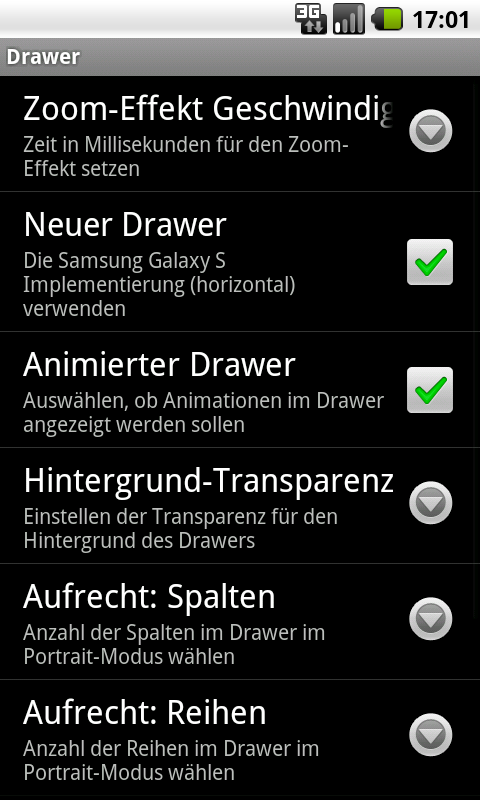 You can choose which Drawer you want to use (Normal or Galaxy S) under Drawer settings, as well as decide if the drawers should be animated. This is a really cool feature, I find. The Previews (quick access to screens) can be displayed in Sense-Style or in a row at the bottom of the screen. You can also switch off the elements in the background. Furthermore, you can choose to switch the Dots and/or the additional bar on or off, as well as deactivate the two action buttons. You can also determine a few optical changes, like the fact that the icons have nothing written on them, for instance. ADW.Launcher is another very good homescreen replacement. I was especially impressed with the Galaxy S app bar, as well as by all the different settings (determining the scrolling speed, settings via the home button, etc.). I didn’t encounter any problems with ADW.Launcher. It runs very fast and smoothly. i also really enjoy ADW.Launcher ive tried just about all the most popular home replacement apps and this one ive noticed gives a good ratio of functionality to effectivness. Thanks for the feedback -- I can see what you mean re: Launcherpro, but the controls on ADW.Launcher really are something else in comparison to other homescreen apps.